Recently, I was made aware of a report from an analytical testing lab comparing the levels of boswellic acid in frankincense oil samples from two popular resellers of essential oils and aromatherapy products. The report immediately caught my eye for two reasons, first because of my love and experience with analysis of frankincense oils from many different regions, and second because of my curiosity about the relevance of boswellic acid in such a product as a steam distilled essential oil. The whole notion seemed very curious to me because of what I knew to be true about the structure of boswellic acid. Given this observed upper weight limit of essential oil components being maxed out in the diterpenoid range, one would predict that finding non-volatile triterpenoid molecules in a steam distilled product would be an incredible finding worthy of substantial attention in literature, however no such reports could be found. 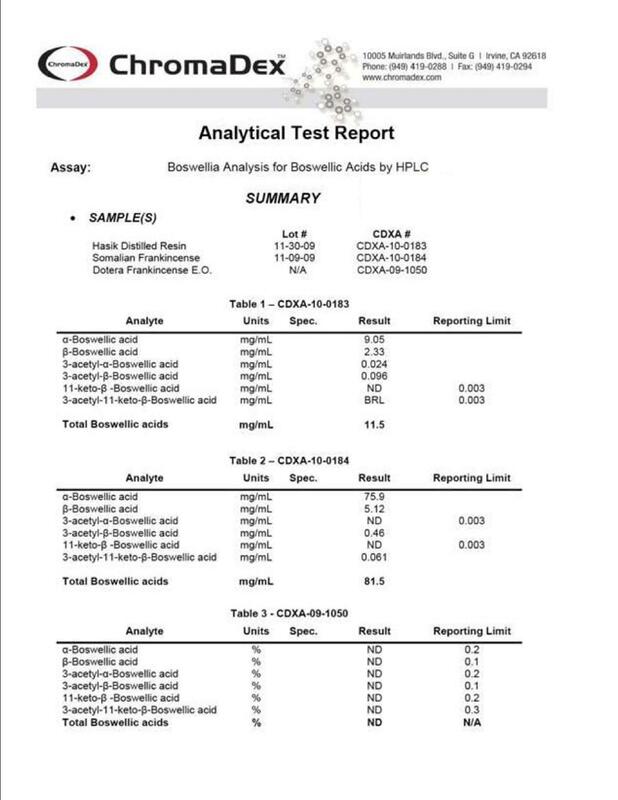 Furthermore, upon closer examination of the lab report making the claims (see report below), one finds that the determination of boswellic acids in the frankincense was determined by HPLC (High Pressure Liquid Chromatography). HPLC is a method used for the analysis of non-volatile components dissolved in solution because these components will not elute on a column by GC (Gas Chromatography) methods. Steam distilled essential oils are necessarily composed of volatile organic molecules because it is their volatility that allows them to be distilled in the first place. For this reason, the chosen method of analysis for steam distilled essential oil components is Gas Chromatography, not Liquid Chromatography, and all known steam distilled essential oil components are detectable by Gas Chromatographic methods. But our experiments with reference samples of boswellic acid did not detect any trace of said components by GC when attempts were made to analyze dissolved solutions of the pure component, even when the GC run was maxed out at 260 degrees Centigrade and a total run time of 140 minutes (normal GC run times are 30 to 60 minutes). This is very strong evidence that obtaining boswellic acid in an essential oil by steam distillation would a physical impossibility even at percentages of only a fraction of a percent. But even if one optimistically hoped it would be possible to get trace amounts of triterpenoids by steam distillation it would certainly be out of the question to hope for any significant concentration. As shown in the report, the total triterpenoid level (in the form of boswellic acids plus acetyl and keto derivatives) for samples #1 and #2 were shown to be 11.5 and 81.5 grams per milliliter. This corresponds to 1.15% and 8.15% respectively. Needless to say that this finding is highly suspect, given the extreme rarity of their smaller cousins, i.e. the oxygenated diterpenoids which have molecular weights that are roughly 150 units smaller. 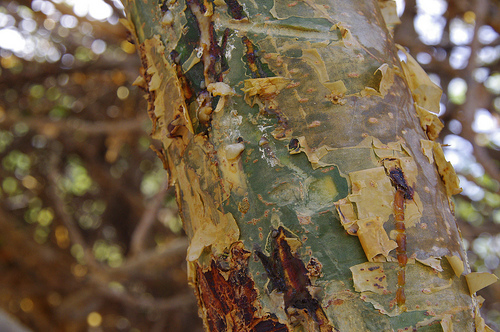 In summary, if the report claiming high levels of the triterpenoid boswellic acid in steam distilled frankincense oil is analytically accurate, then one would necessarily come to one of two conclusions: 1. the samples were not really steam or hydro distilled but from an extracted product, or 2. samples were adulterated with boswellic acid from another source. It is my professional opinion as an essential oil chemist that the presence of boswellic acids, despite their potential therapeutic value, are not appropriate markers of quality for pure steam distillate of frankincense resin, in fact, quite the contrary. Ironically, the MLM rep who was attempting to use the report to make his product look superior only succeeded in making himself look uneducated and his competitor’s oil look to be the more authentic!